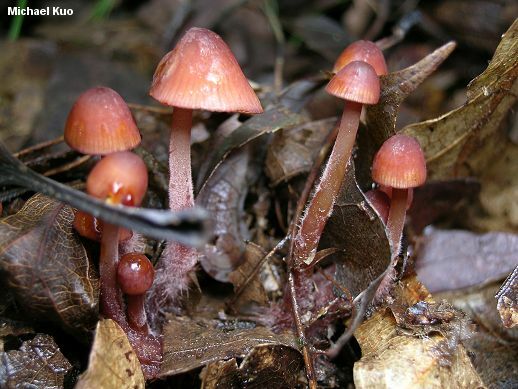 One of the so-called "bleeding mycenas," Mycena atkinsoniana exudes a yellow to orange juice when sliced. In my collections the color of the juice has been quite yellow, and reminiscent of the exudate from Peziza succosa. 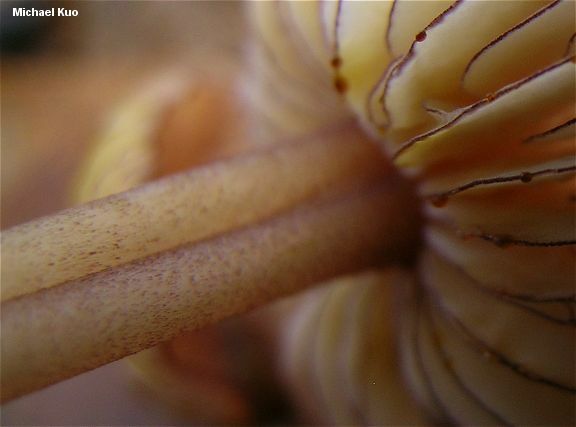 Aside from the juice, distinguishing features include the upper stem surface, which is decorated with tiny purplish brown fibers (use a hand lens)--and the gills, which are pale yellow but feature maroon edges. 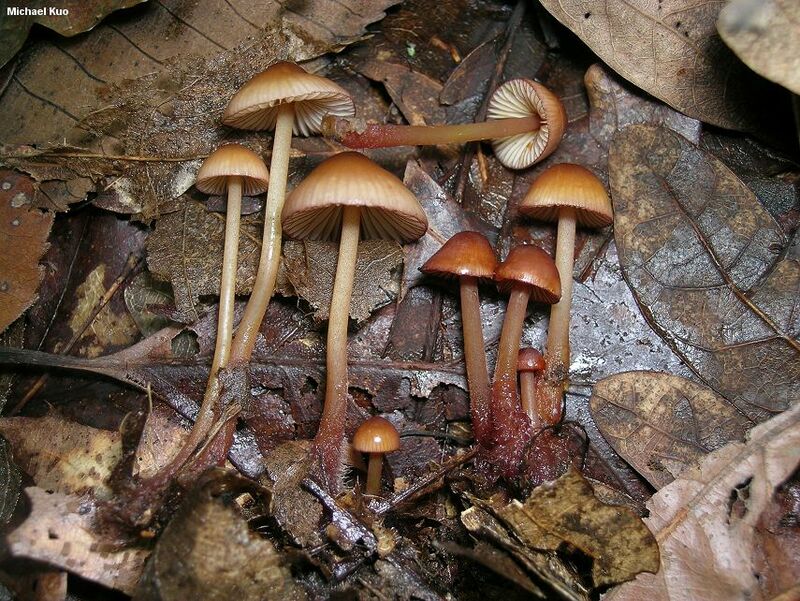 Mycena atkinsoniana was originally described from collections associated with beech, but it is also frequently found under eastern North American oaks. Ecology: Saprobic on fallen leaves of oak and beech; growing scattered, gregariously, or in loose clusters; late summer and fall; eastern North America. Cap: Up to 3 cm across; convex to broadly conical, sometimes becoming bell-shaped; dry or slightly tacky; bald; brownish red to reddish brown over the center, with golden to yellow shades developing elsewhere; the margin becoming lined with maturity; often with a thin maroon line at the outer edge. 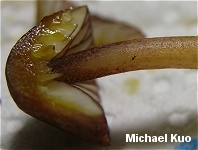 Gills: Narrowly attached to the stem; close; very pale yellow when young, becoming stained darker yellow with age; with maroon edges. 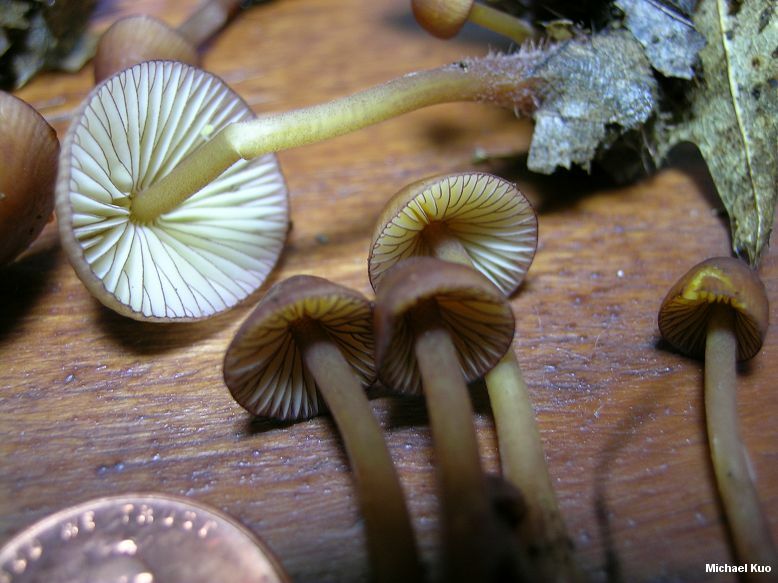 Stem: 2-6 cm long; 2-3 mm thick; equal; hollow; adorned with tiny purplish brown fibers (use a hand lens); reddish brown to brownish, fading to yellowish; exuding a yellow to orange or reddish brown juice when sliced open; basal mycelium hairy and whitish, or when wet purplish brown. Flesh: Insubstantial; pallid or brownish; exuding a yellow to orange or reddish brown juice when sliced. Chemical Reactions: KOH on cap surface negative to yellow; erasing red pigments. 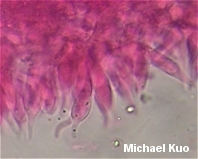 Microscopic Features: Spores 7-9 x 3-6 µ; weakly to moderately amyloid; elliptical; smooth. Basidia 4-spored. Cheilocystidia abundant; up to 60 x 8 µ; fusiform. Pleurocystidia absent or rare; when present similar to cheilocystidia. REFERENCES: A. H. Smith, 1947. (Smith, 1935 [M. "fagicola"].) Herb. Kuo 10290403, 09281103.